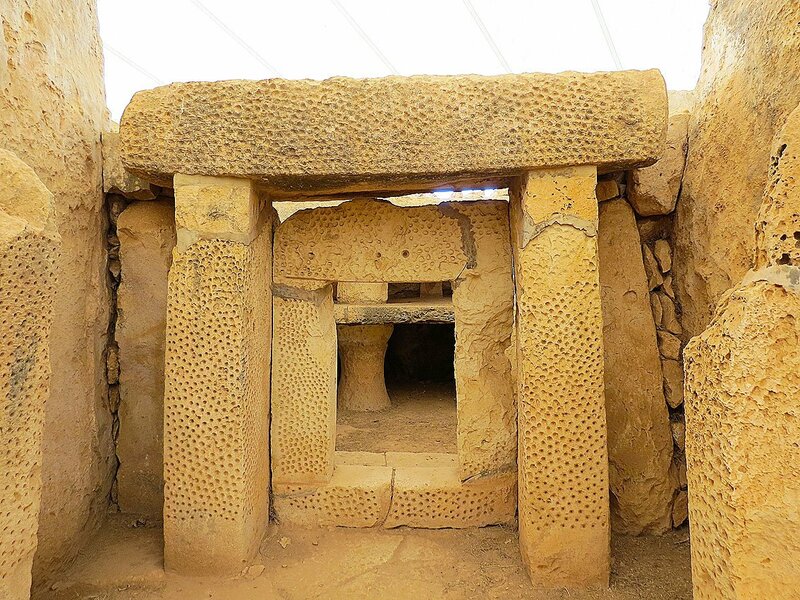 The Hagar Qim and Mnajdra Archaeological Park constitutes the largest archaeological site in Malta and probably the most impressive too. I hadn’t visited since the two main temple complexes were covered to protect them against the elements in 2009 so I was somewhat wary of seeing the temples in this new, strange way. My fears were unwarranted and I wasn’t in the least disappointed. 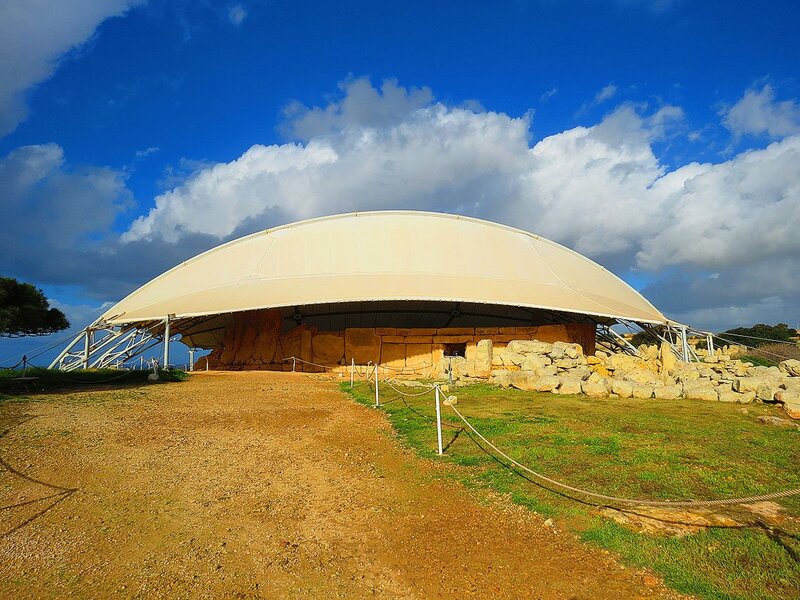 Apart from the protecting tents the complex now houses a state of the art interpretation centre which serves to whet one’s appetite for the wonders to come. There is plenty of information and a good sample of finds from the temples – plus a play area where children can assemble their own version of the temples with real but manageably sized limestone blocks. Best of all is the highly impressive 4D audio visual presentation, which, in seven short (way too short) minutes, recounts the history of the temples in a way which is literally spine tingling – the effects of cold, rain and thunder at the collapse of the temples era ensure that! largest weighing in at a mighty 20 tons – were manoeuvred and set in place; how the megaliths were dressed and fitted side by side with such precision using the simplest of hand tools, and ultimately what sort of cataclysm might have led to the sudden disappearance of this highly evolved and unique culture. There is plenty of space in which to ponder all this – the archaeological park now comprises a sizable area – suffice to say that the two main temples are located a good 500 metres away from each other. But there is more. The park now includes a nature trail which takes you to the edge of the Wied ix-Xaqqa ravine – a deep gorge which exits on the rocky shoreline some way to the west of the temples. Of some note though little visited are the so called Misqa Tanks, a flat area of bare rock near the temples. This site-within-a-site contains seven bell-shaped reservoirs which still retain rain water in the wetter months. It is likely that this site provided the water needs for the temple community. The park also includes one of the thirteen coastal towers constructed during the reign of Grand Master De Redin. This is the Hamrija tower, constructed in 1659 and the twelfth out of the thirteen built by this Grand Master. 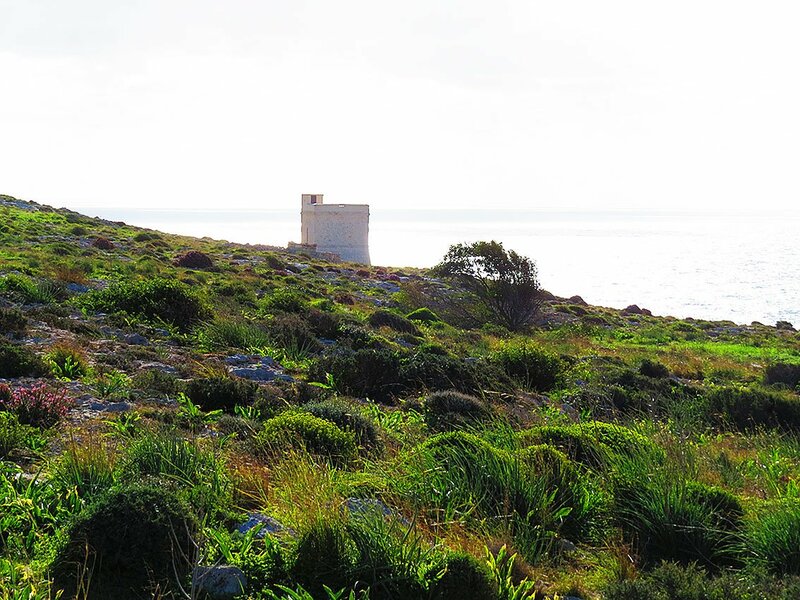 Near the tower is a small memorial that commemorates Sir Walter Norris Congreve, who served as the British Governor of Malta between 1924 and 1927. At his request he was buried at sea in the channel between Malta and the islet of Filfla and the channel is still known as the Congreve Channel to this day.